Over the past couple of years, I have been working out how to support myself financially as a knitter. Knitwear design — my main love — is not very difficult to break to, but very tough to earn a living at. Interestingly enough, teaching knitting can be more lucrative, but also more sporadic. 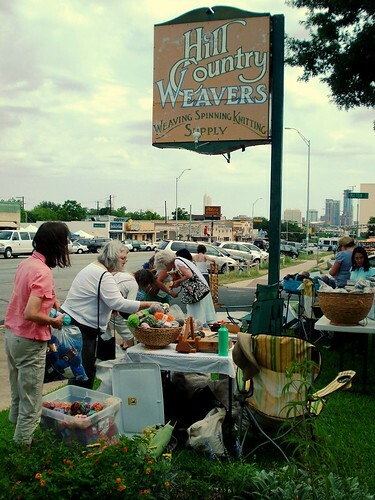 So I decided to try my hand at working in one of our local yarn stores, Hill Country Weavers. It’s an amazing shop: the owner, Suzanne, opened it 30 years ago, and it’s now an emporium of yarn treasures, both workhorse and precious. While I won’t be working there full time for the foreseeable future (the timing just didn’t work out for either me or the store) I did learn some important lessons from working in this lovely shop — lessons that have been valuable to me as a knitting designer and teacher. Knitters and crocheters are impulse buyers: We are magpies. We see the shiny and we wants it. Over and over again, I saw customers pick up well-finished, well-displayed samples and ask for the pattern and yarn it was made with. If you want that same response to your designs, make your photography so luscious the viewer will want to eat it and your materials list easy to find and read. Did I mention we like the shiny? If you wholesale your patterns, send them out in an attractive binder. HCW has dozens of pattern binders, but a few that stand out and are frequently grabbed — the ones with the nice three-ring binders. I’m looking at you, Churchmouse Yarns. Yarn substitution is happening everywhere — aid and abet it: While many knitters and crocheters want to use the exact yarn — even the same color — used in the pattern, there are many others who want to substitute another yarn. Often this happens because the store, as big as it is, doesn’t carry the specific yarn called for in the pattern. If you can, in your pattern recommend a couple of substitute yarns that you think would work well. At least one of these yarns should be a yarn that is widely available and relatively inexpensive. Do this, and you will sell more patterns and have more successful projects posted online. Make it easier for teachers to teach your projects: In my limited experience, technique-based classes fill up more than project-based classes. But teachers of technique-based classes often still want a project for their students. On Ravelry, make sure to include any techniques used in your pattern, both in the tags and in the description. That way, a teacher can find your pattern more easily and use it as a project for her class. To make your pattern even more attractive, you might also offer a discount to classes and knitting groups over a certain size. Booklets seem to sell well: HCW carries a huge stock of books and individual patterns, but those often get passed over in favor of the booklet — that is, the 8-20 page, soft-cover collection of a dozen or so patterns. Think Ysolda, Stephen West, and all those wonderful Berroco and Classic Elite collections. In a bad economy, particularly, these seem to strike knitters and crocheters as the most attractive option. You get the economy of scale that comes with purchasing several patterns at once, while not having to commit to $25-30 worth of book. This entry was posted in Design Tips & Tools, knitting, knitting design, knitwear design by Elizabeth GM. Bookmark the permalink. The “shiny binder” cartoon from Calvin & Hobbes! Alongside being positively violent in my adoration for you, you also make a lot of sense. I have a BASKET of shiny yarn by my legs. I don’t know when I love it more: in a big sparkly pile in that basket or all knitted up around a loved one’s neck. I vote the latter.. Fantastic post! I had picked up a couple of these by hanging out with knitters, and in yarn stores (mostly that knitters like shiny, and teachers like easy to teach patterns), but hadn’t thought about the binders or the booklets. Thanks for sharing. Those are some really good ideas – thanks for sharing them! What an interesting post! Thanks for passing along your experience.